Dark Renewal is an excellent card, but despite its better future potential as currently constituted, I sometimes wish this was a Dark Magician support card. Often times, one of the problems of Dark Magician decks is the battle for deck space between cards that Dark Magical Circle can add to your hand when activated and those that it cannot. The difference between winning and losing can sometimes be the result of whether or not you got that initial plus off Circle. But I digress. Dark Renewal is an excellent card. Now, of course it’s a shame that it doesn’t tribute the two monsters like the original anime effect. While “sending” monsters to the grave is normally good and definitely nothing to complain about (as opposed to bouncing or destroying), it would have been optimal if it also avoided targeting or being an effect that could “affect” a monster. The nice part about this card, of course, is that it can summon a monster from a vast pool that will only grow with time. Mark my words, Dark Renewal will one day see itself in a tier 1 deck. Anything that can summon a monster of any level from the deck eventually finds its way to being abused. As for whether or not to run it in Dark Magician decks, I think that’s just a matter of preference. It’s a tad slow, but it’s obviously powerful in the right situation, and it only got better with the release of Apprentice Illusion Magician. It probably depends on what kind of Dark Magician deck you run. If it’s a tight build with a low monster count, it probably wouldn’t be as good as in a build with more low-level monsters in it such as the Wind Witch variant. You need to sacrifice one of your monsters after all. But no matter what, Dark Renewal can be valuable as a side deck option for opponent boss monsters that need to be dealt with. Hold on to three copies of this card, because it has a bright future. Cons: Is deeply meta-dependent since it only works on DARK Spellcasters ; Dependent on having a monster (can make monster-less opening hands even worse. Dark Renewal complete the week and is another great Spellcaster support card. Spellcaster-specific, sending monsters avoids destruction trigger effects. Special Summon from the deck will thin the deck, if from the grave you get a resource back. You can’t activate this card unless your opponent Normal or Special Summons a monster, so if they have already established their field you may be out of luck. It is a great card to pull a card like Dark Magician from your deck to the field, triggering something like Dark Magical Circle. The best effect of this card is that it does not destroy, but sends the monsters to the grave. Dark Renewal looked like a 3/5 average Normal Trap Card. It doesn’t destroy which is good. It send an opponent’s Normal or Special Summoned monster to the grave along with a Spellcaster you control. Both monsters have to be targeted to be sent to the grave. Then you can Special Summon a Dark Spellcaster-type from the Deck or Grave. So this will only even work in a Spellcaster Deck, and will only break even in a Dark Spellcaster Deck. Gaining field advantage is good, but this Trap cannot be chained. And as for dealing with newly summoned monster, the Solemns do that much more reliably. However, getting Dark Magician or another Dark Spellcaster from the deck or grave is really good, so the score will reflect that option and future potential. We end this week with a cool trap for all Dark Spellcaster Decks, and a solid one at that. Dark Renewal! When your opponent Normal/Special Summons a monster(s) you can target one of those monsters and a Spellcaster you control and send both monsters to the GY. Then, you can summon a Dark Spellcaster from the deck. Summoning from the deck is the best when it comes to summoning a non Extra Deck monster. Also, it can rid you of a threating monster before it becomes a major issue. The card is great, but not necessary in the most relevant Dark Spellcaster deck, Dark Magician. I’m sure you could slide with 1 or 2 in your deck, but the card has potential with future Dark Spellcaster monsters/archetypes potentially coming. You never know. Dark Renewal isn’t specific Dark Magicain support, but good support for a Dark Spellcaster player nonetheless. 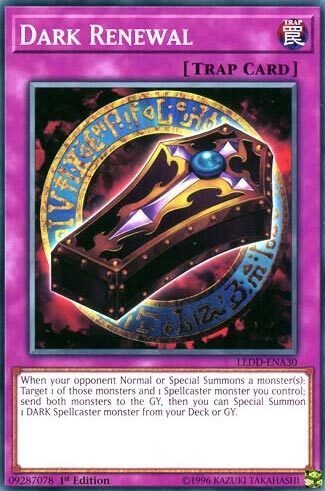 We saw Yugi use this two times I believe. (I recall against Noah, in his first duel in the DOMA arc, and Arkana played it too I believe). When your opponent Normal or Special Summons a Monster, target one (note it doesn’t have to be the Monster that triggers this card) and one of your Spellcaster Monsters, to Special Summon a Dark Spellcaster from your Graveyard. It is worth noting, this is technically a -1. You give up two cards (this and a Monster) to get one back, but you’re getting something stronger, and your opponent loses a Monster too, so it’s not a traditional -1. Is this card good? Yes, and I standby that, but is it a staple in Spellcaster? I’d have to say no. Previous articleAn exciting new update is heading to Pokkén Tournament DX!